Not quite a full map, but rather a preview of the project I'm working on, sort of an atlas of the Where Hearts Were Entertaining June universe. 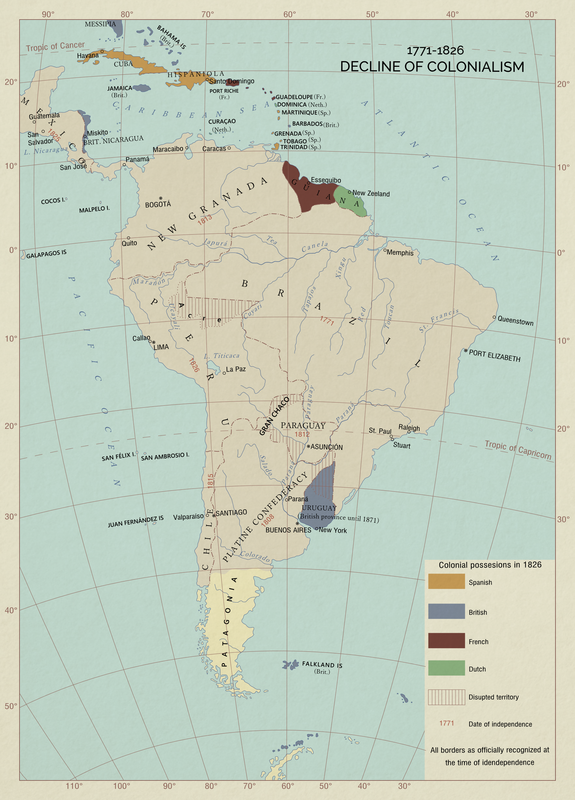 This one is an inset map that shows the decline of colonialism in South America. It starts off with English Brazil breaking away as the United Kingdom of Brazil, and after a few decades continues first in the Southern Cone with Brazilian help, then in northern South America and Central America without Brazilian assistance. The presence or lack of Brazilian help in the independence of the various states of South and Central America is a major sticking point for years to come that divides the Spanish-speaking nations of the Americas. Many thanks to Reagent on Ah.com for help with the Portuguese and river names.